After spending two days in Phnom Pehn hanging around the Laos’ and Vietnamese’ embassies, Therese and I climbed onto a bus heading across the Cambodian border to Laos. We’ve been looking forward to the Laos portion of our trip since we decided to add the country to our itinerary in January. When you mention Laos to any backpacker in Southeast Asia only positive stories and anecdotes are shared. It is also known for being somewhat less touristy (and less traveled) allowing some of the natural destinations (caves, islands, mountains etc.) to have a more authentic feel. Islands emerge in the Mekong in Southern Laos. The border crossing into Laos was much smoother than Cambodia and we arrived in a small town on the edge of the Mekong river around 5:30 p.m. as the sun was starting to sink low into the sky. We were herded, along with maybe 15 other backpackers, into long narrow flat bottom boat with propellers extended way out along a pole of the stern so it could accommodate the shallow water. With the backpacks and people filling the boat to the gills we set off across the river, catching our first glimpse of the countless islands that won the region the name The 4000 Islands. 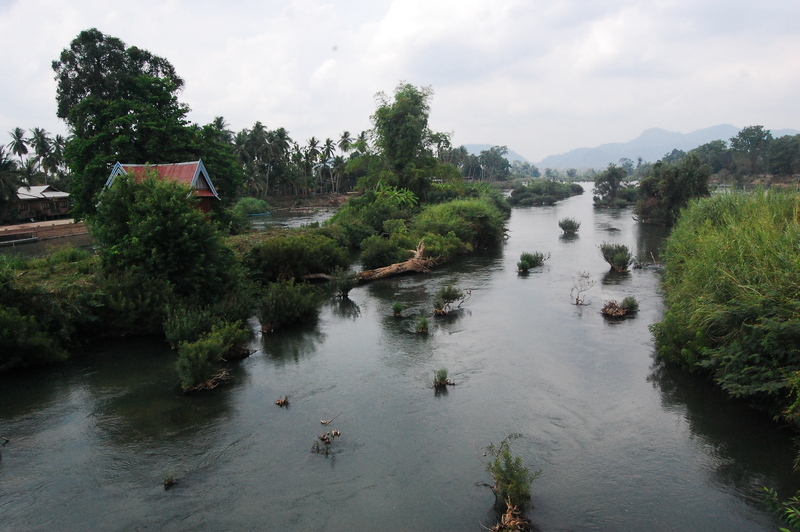 The islands are a river archipelago and only about half of them are exposed when the Mekong floods each rainy season. Right now we’re experiencing the dry season in Laos though, so the water is low allowing the tufts of grass and trees to appear as if floating along with the current of the river. As our boat pulled up to a little beach on one of the main islands, Don Det, and we unloaded our gear, the sun started to set, colour painting the way down the small dirt road that we would search for somewhere to stay. Our home in Don Det for three lovely nights. 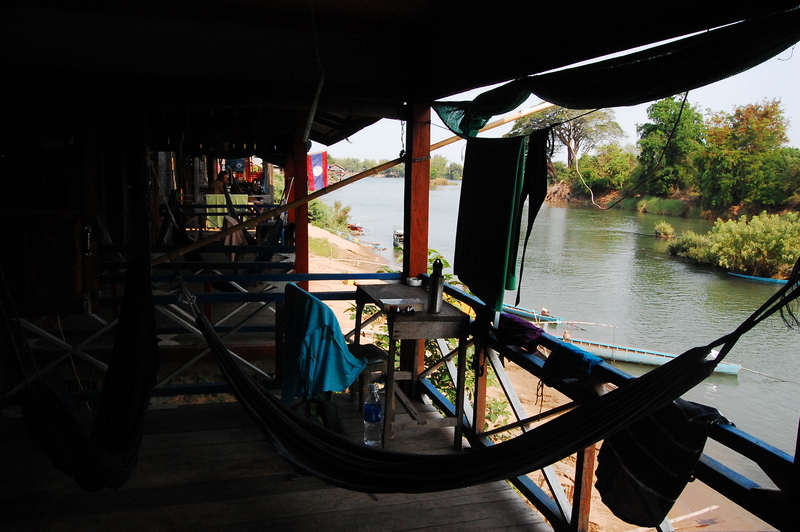 After checking out a few spots we settled on a rustic bungalow perched on stilts at the river’s edge. Although there were no screens in the windows and you could peer outside through cracks in the walls, the little wooden room felt so cottage-y we couldn’t resist. Plus there were two hammocks hanging on a private deck out our front door. A shared bathroom and mosquito net was worth the other perks! After our first breezy sleep in weeks Therese and I woke up refreshed. We had met a lovely girl from California the night before at dinner and agreed to meet up in the morning for an adventure so we headed to the beach where we rented some bicycles and took off cycling along the river. 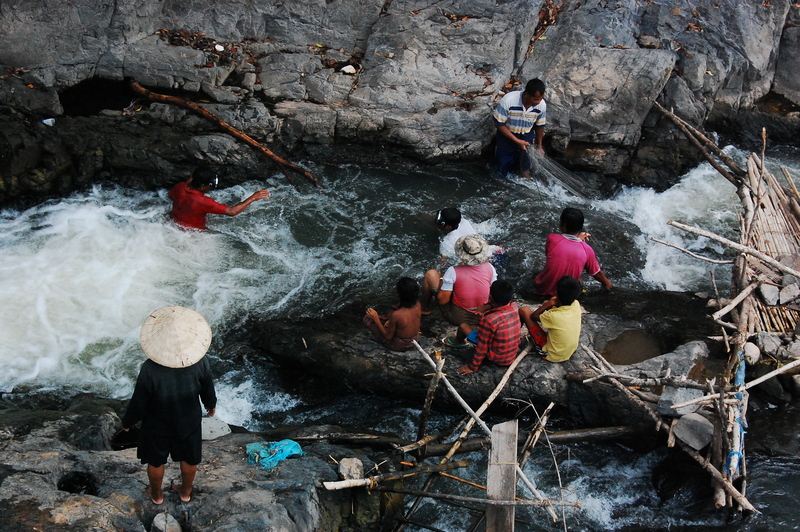 Local fishermen stretch nets across the rapids of one of Don Khon's waterfalls. Don Det is the smaller of two islands that have accommodation in the 4000 Islands. 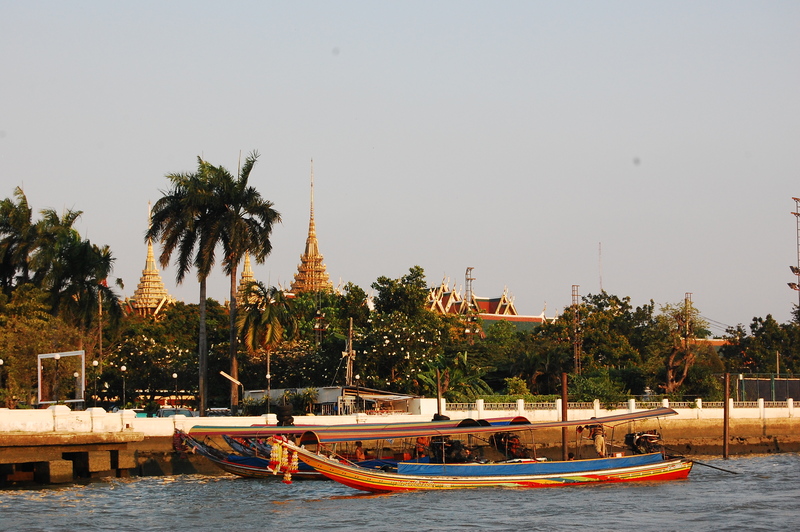 The larger island is Don Khon which Don Det is joined to by a bridge. We rode to the end of Don Det making our way across the bumpy bridge to Don Khon to see some of the larger island’s waterfalls and hire a boat out onto the river in the hopes of spotting the fresh water dolphins the area is known for. 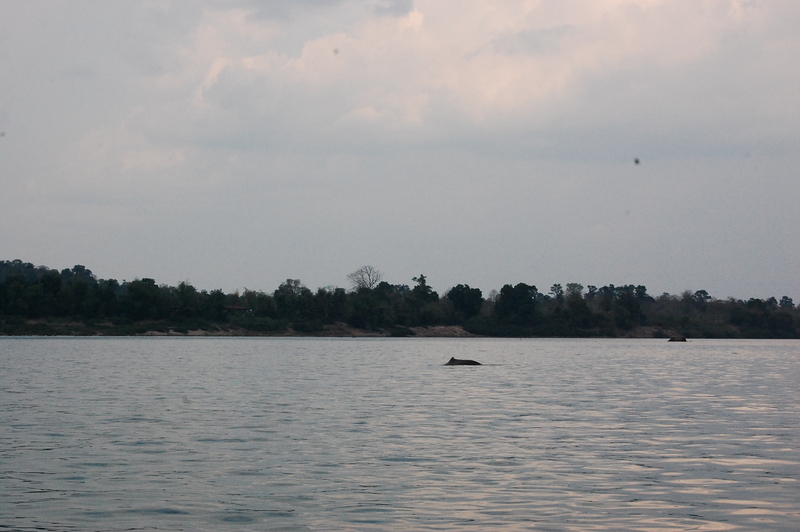 I think we all had low expectations for dolphin sightings as we set out in our little boat with an elderly Laos driver. As we maneuvered around the trees and ferns growing out of the river we all sat quietly, scanning the churning water. An Irrawaddy dolphin surfaces in the Mekong river. When we spotted our first Irrawaddy dolphin the cries of excitement made our driver burst into a smile, laughing as we all shouted and pointed at the distant grey blurs. As we grew closer (or rather, the dolphins came closer to us) we saw some kick up their tails, clear their blow holes and one even rolled over waving a fin and exposing his slightly pink belly. The Irrawaddy dolphins are a critically endangered species and only few still exist in Southeast Asia, particularly in this area. We spent an hour coasting with the current, turning our heads in circles to watch the dolphins play before heading back to land with massive smiles plastered on our faces. 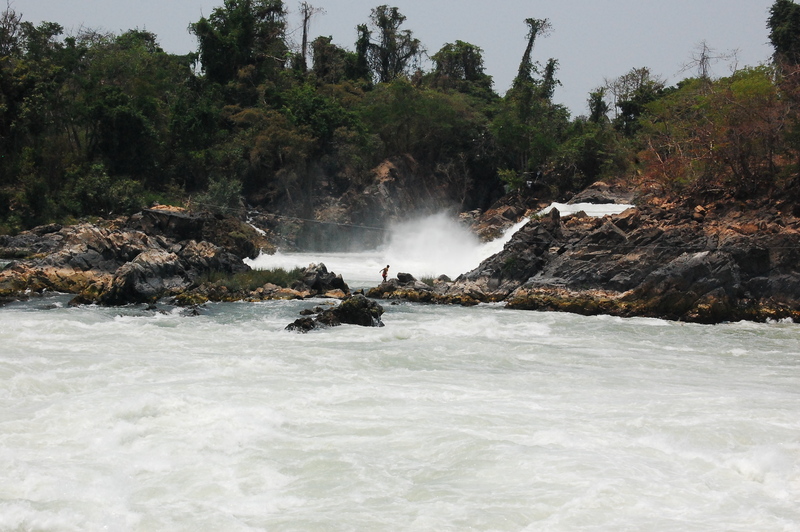 The next day we booked transportation to visit Khone Phapheng Falls on the Mekong river. Known as the largest waterfall in Southeast Asia this waterfall isn’t tall or tropical – it’s a massive wall of water stretching across a section of the Mekong where the river’s power and volume is exposed. Therese and I had watched some of the BBC series Human Planet while in Korea and this particular waterfall was featured in the episode on people that rely on rivers, highlighting the dare devil fishermen who walk on wires across the falls to catch catfish. After watching the story of this community unfold we had to see the sight for ourselves and we weren’t disappointed. As we arrived fishermen were inching along the wire as the water pounded into the rapids below. When I skyped with my parents and told them about the falls my Dad asked how the size of the falls compared to Niagra. 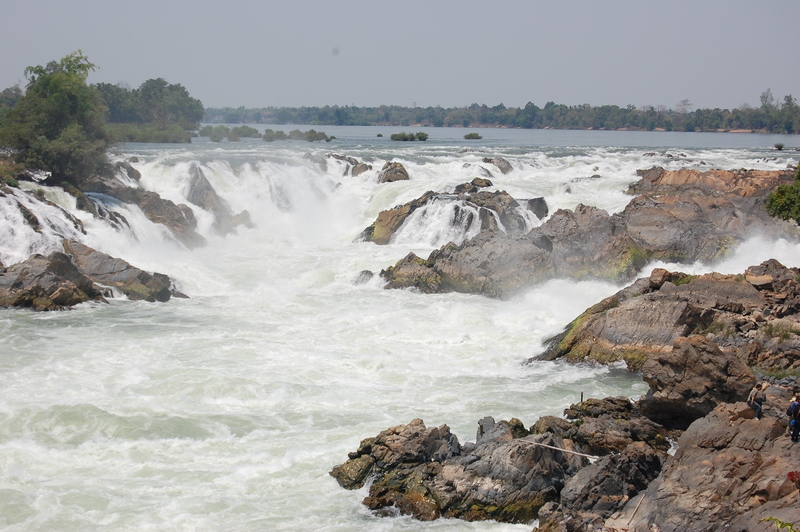 It’s hard to say as Niagra Falls is truly massive so nothing quite compares, but the sight of the Khone Phapheng falls seemed to really express the power of nature. 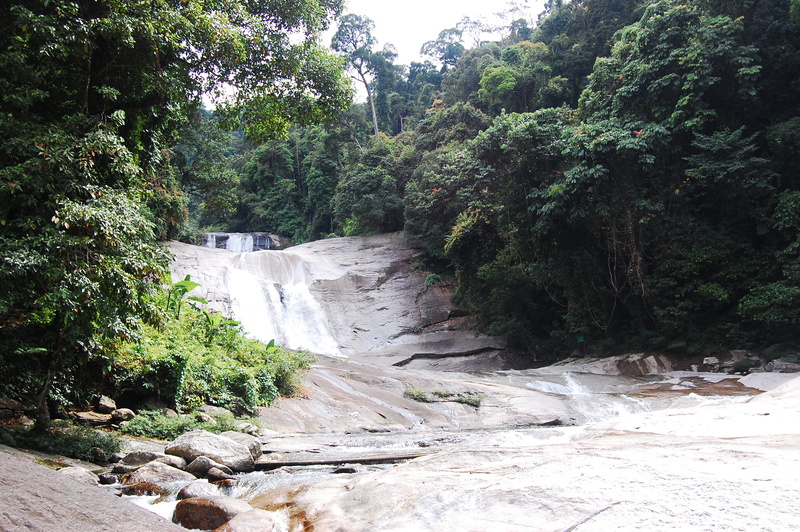 The statistics are that the falls reach 21 meters high and the rapid stretch for nearly 10 kilometers. The area is not particularly touristy and so you feel like you are in the wild, witnessing this incredible sight. There are no restrictions on where you can go so we crawled along the scorching rock above the rapids breathing in the fresh water spray. The rest of the day we spent lounging in our hammocks, reading and catching up on postcards, really enjoying the serenity of the 4000 islands. Quite cozy on the bus to Laos' capital city. We’re now in Vang Vieng after a night in Vientienne and a thrilling overnight bus ride where the two of us shared a single bed bunk bed for the 12 hour ride. Yes, there were bunk beds on the bus. Our trip is starting to wind down now and we’re both quite giddy. The moments where we stop to appreciate the things we’re seeing and experiencing are occurring more often, as are our discussions of flights and first things to eat when we get home. Only Luang Prabang, a homestay in Northern Laos and Southern Vietnam left and then it’s back to Canada for the both of us. After a rather frustrating trip across the border Therese and I arrived in Cambodia in Siem Reap. It took longer than we planned and cost more than we wanted but we made it, found a great little guest house on the river, ate some food and went to sleep. This rather uneventful day prepared us for our early morning the next day and our visit to the ancient temples of Angkor Wat. The Angkor Wat complex is made up of multiple temples, some located near the main temple in Angkor Thom and some in the surrounding area up to 100km away. For our first day we decided to keep it local and save the temple further afield for another day. We rented bikes from our hostel and rode from Siem Reap’s downtown core to the archeological park, riding from temple to temple, (the complex is massive, sometimes we’d pedal for 20 minutes through the jungle before we stumbled across more ruins) hopping of to explore and guzzling water along the way. We each took about 200 photos but I’ve uploaded a selection for you to flip through. My favourite temple was the Bayon Temple in Angkor Thom. This temple is made up of 54 crumbling towers each topped with 4 massive stone carving of faces staring down at you. A close second was Ta Prohm, or what Therese and I refered to as the “jungle temple.” This one was located deep in the forest and trees grew out of the walls. It was also the site for some of the filming for Tomb Raider. Tomorrow Therese and I will travel further from Siem Reap to what we are calling the river temple, 50 km from the city. After spending two days in Khao Sok National Park (I’ll write about that another day) Therese and I walked out to the road to catch our bus to Surat Thani where we would take a night train to Bangkok. Rain started to drizzle as we walked along the road to the bus stop an hour early. We had a train to catch at 9:30 p.m. and wanted to make sure we caught the last bus into town. After 1.5 hours it became clear the bus wasn’t going to show up. To be honest I was a little panicked and we sat on the side of the road weighing our options. We could wait another hour for a minibus ride at 5 times the cost of the local bus we were going to take or we could try to hitch-hike the 2 hour drive into town. It didn’t take long for Therese and I to agree we may as well try hitching a ride.After a few tries a minivan pulled over and we walked up to the window to see the faces of 7 Thai Navy men staring back at us. One of them spoke English and said they would take us an hour toward’s town where we could catch a different local bus to take us the rest of the way, so we climbed it. It was a pretty surreal experience. I sat next to the fellow who spoke English and discovered this was the Seahawk Squadron II, a helicopter squadron that flies off of a air-craft carrier (apparently the smallest ship of its kind in the world). They were on their way back to the base after spending five days delivering doctors, dentists and supplies to a remote tribal village. When we got to our destination we discovered no buses were running – it was already 7:30 by this time and I started to think maybe we should have just taken a minibus. Luckily we had become quite chummy with our new Navy friends and they were determined to get us to our train in time. Calling up a friend they managed to get us another ride the rest of the way into tow. Their kindness still astounds me – we were quite lucky the situation worked out. When we arrived in Surat Thani we found out our train had been delayed an hour so at 9:30 we found our way to a little street food stall with folding tables setup in an alley way and sat down to one of the best meals we had in Thailand. Tom Yum soup, Pad Thai, vegetables with ginger! Delicious. 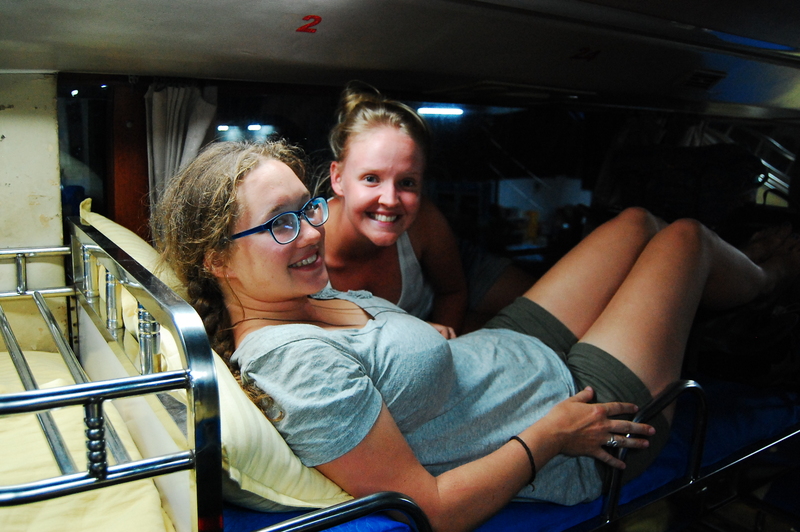 The train ride to Bangkok was pretty terrible – our cheap pocketbooks convinced us to get second class seat tickets instead of sleepers for the 13 hour ride and we regretted it instantly. We arrived in Bangkok eventually and took a city bus downtown to a backpacker neighborhood near some of the city’s main sites. That night we ate some street food and wandered around the neighborhood agreeing to split up the next day to take on Bangkok. 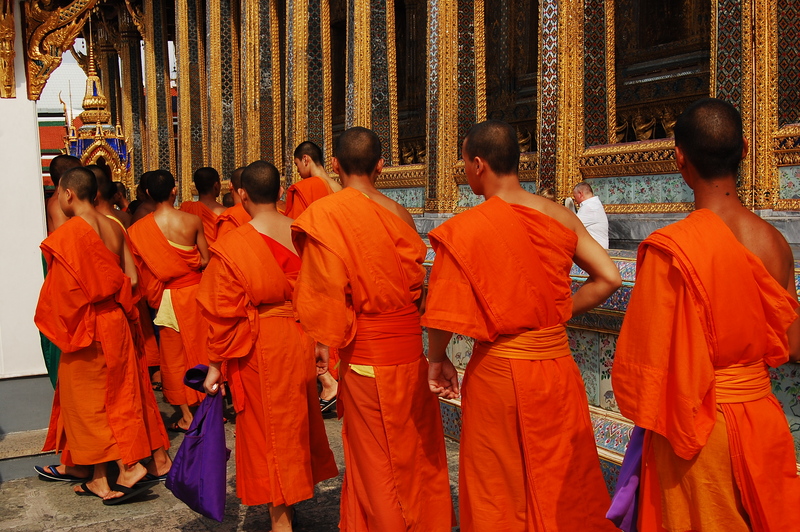 Monks arriving at Wat Phrakaew in Bangkok. I woke up at 7 a.m. and got dressed in pants, a tank top and light sweater. I was going to tackle some of the city’s famous temples and needed to be covered up. I walked along the canal to the Grand Palace and its accompanying temple Wat Phrakaew. I arrived as it opened at 8:30 a.m. and quickly discovered some sort of ceremony or event was happening as groups of school children, monks and the royal guard processed through the grounds. 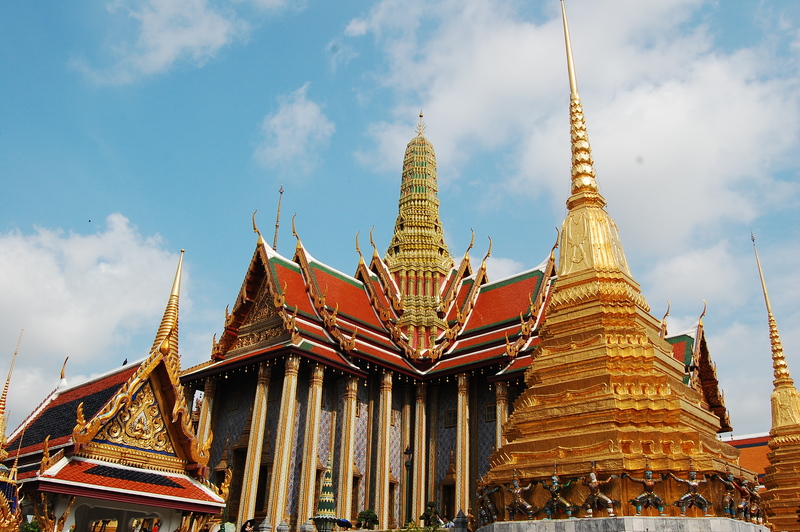 Gilded buildings of Wat Phrakaew, home to the emerald buddha. The temples in Thailand are unlike any others I have seen so far on my travels. Unlike the ornate carved wood style of Korean and Chinese temples or the intricate stonework in Malaysia, Thai temples are towers of gilded mosaic. White stucco adorned with jewel-toned glass and gold-plated spires. In the sun everything sparkles, forcing you to blink as you try to take in the sights. 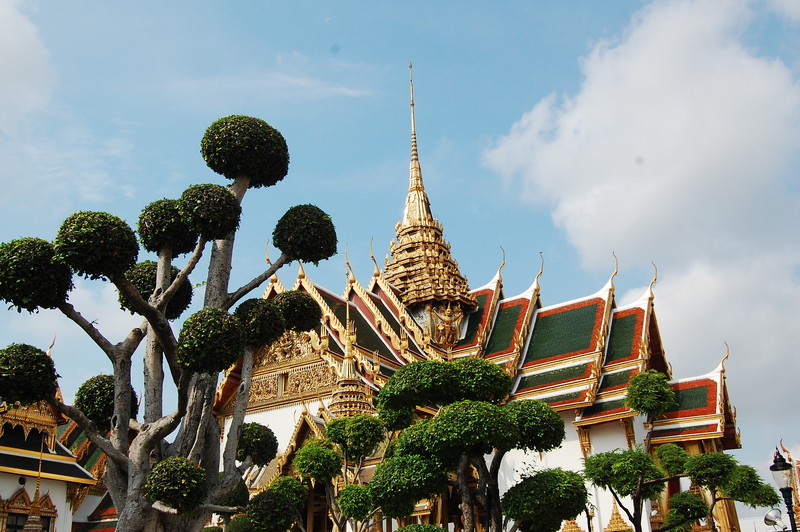 The Grand Palace is part of the Wat Phrakaew complex. Although it is not the official royal residence anymore the site is still used for special occasions and ceremonies and the grounds are meticulously cared for. My favourite part of wandering the complex was seeing the maintenance staff painting the white stucco and watering the elaborate gardens, all with smiles on their faces. Reclining Buddha at Wat Pho. After spending a couple of hours I made my way along the canal to Wat Pho – another main temple in Bangkok known for being home to a massive reclining Buddha. I am realizing now that pretty much every city has some sort of giant Buddha it is known for. Wat Pho kept up with the glitzy nature of Thai temples, each surface covered in blue, green, red and gold tile work and ornate roof lines. 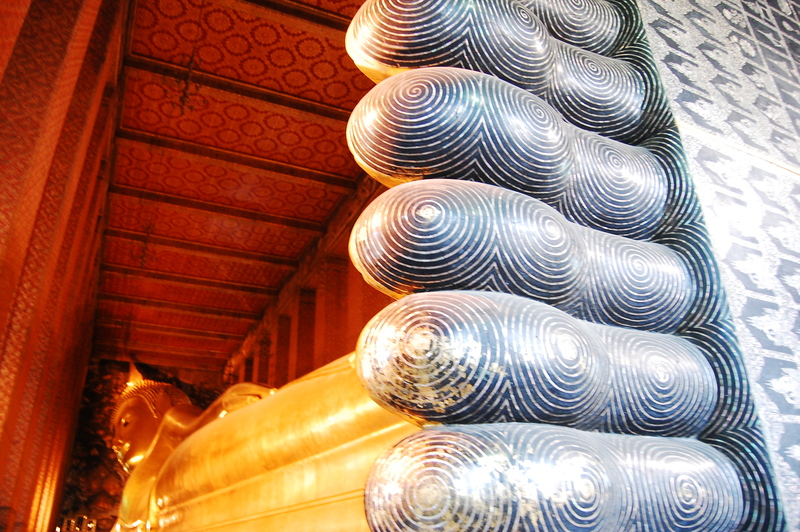 The reclining Buddha was covered in gold leaf, its giant feet inlaid with mother of pearl. View of Bangkok (and Wat Pho) from the canal. The rest of the day I spent riding a boat along the canal and wandering the streets trying to take in as many sites as I could. A lot of walking, wondering where I was and stumbling across a great site or picture of daily life in the city made for a great day. Now I have crossed the border into Cambodia and am staying in Siem Reap. I will update on our visit to Angkor Wat soon. We arrived in Thailand on March 7, flying into the country’s southern airport in Phuket. We spent only a night in the city (gushing over our first authentic Thai meal) before taking a 5 hour minibus ride to Nakhon Si Thammarat to spend some time with my good friend Kaitlyn and her boyfriend Stu who have been living in the city for the past two years. Reunited and it feels so good! Kait and Stu - our gracious hosts. We arrived in Nakhon and Stu and Kait met us with their motorbikes to drive us back to their neighboorhood. It was so exciting to see a familiar (and long-missed) face in the middle of this adventure and it was great fun to experience a part of their life in Thailand. Nakhon is a very Thai city, not often a stop on people’s tours of the country, though it should be. The food is INCREDIBLE, I have the happiest belly in all the world after eating different types of curry, fried catfish, tom yum soup, pad thai, mangoes, coconuts and oranges off the street, smoothies, and papya salads. Staying in Nakhon solidified the fact that I LOVE thai food. One of Thailand's protected waterfalls near Kait and Stu's home. 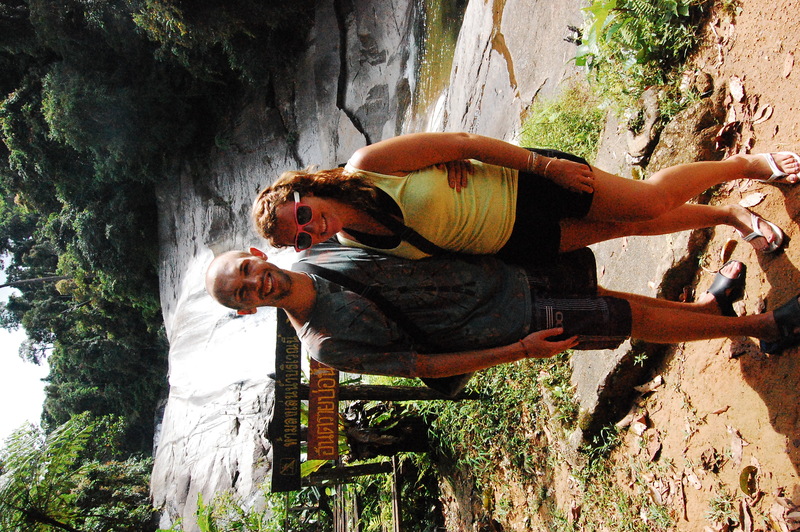 While in Nakhon Kait and Stu took us on a half-hour motorbike ride to a local waterfall and national park. It was the perfect way to spend the day swimming in the fresh water pools of the waterfall and taking in the jungle surroundings. We also were able to join in on the celebration of Stu’s birthday – meeting most of their fellow teachers and friends and eating some great food along the way. Currently I am on Koh Mok, one of the Trang Islands in Thailand. Therese and I arrived here on the March 10 and, after experiencing the incredible beauty of the island’s crystal clear water and peachy sunsets, we decided to stay for three nights. We’re staying in a little room in a rubber tree forest, geckos and frogs climbing over the walls and (occasionally) into our bed. Our room is about a 2 minute walk to the white sands of Farang beach where we spent the greater part of the afternoon yesterday. Therese in her kayak near the opening to the emerald cave -tour boats float around her. 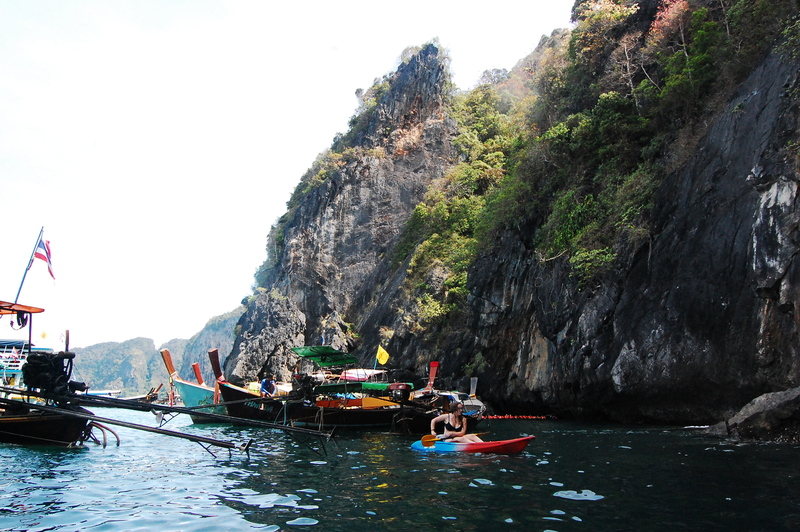 We spent the morning on an adventure to Koh Mok’s famous sight – the Emerald Cave. We awoke around 8 a.m. and had a quick breakfast before heading to the beach where we rented kayaks and a dry sac. We each brought our cameras, our headlamps, some water and sunscreen as we paddled off into the ocean. 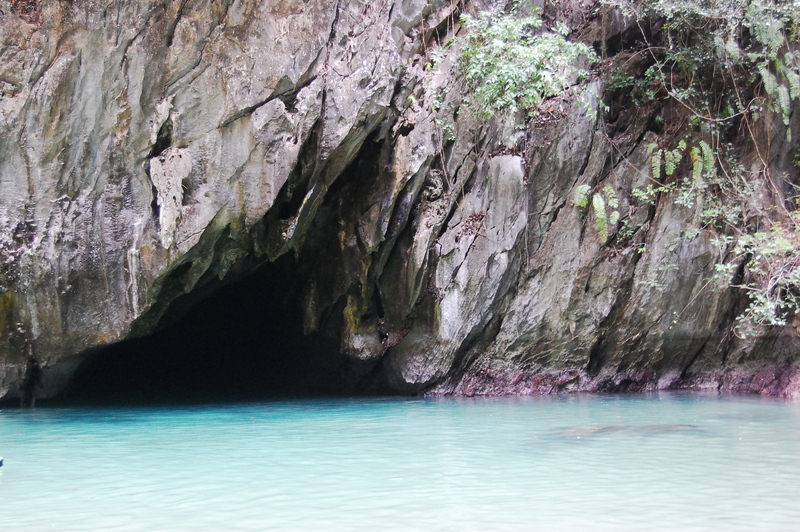 The opening to the Emerald Cave from the lagoon. Using a map Therese had found in one of the hotels we navigated our way around two points arriving at the opening to the emerald cave. This is where things got interesting as we slide off our kayaks, strapped on our headlamps and began the 80 metre swim through the pitch-black cave to a little beach. Many tours are run to this sight with guides leading the way, so Therese and I were feeling pretty good about ourselves as we emerged from the darkness towing our kayaks behind us into the green waters of the Emerald cave. 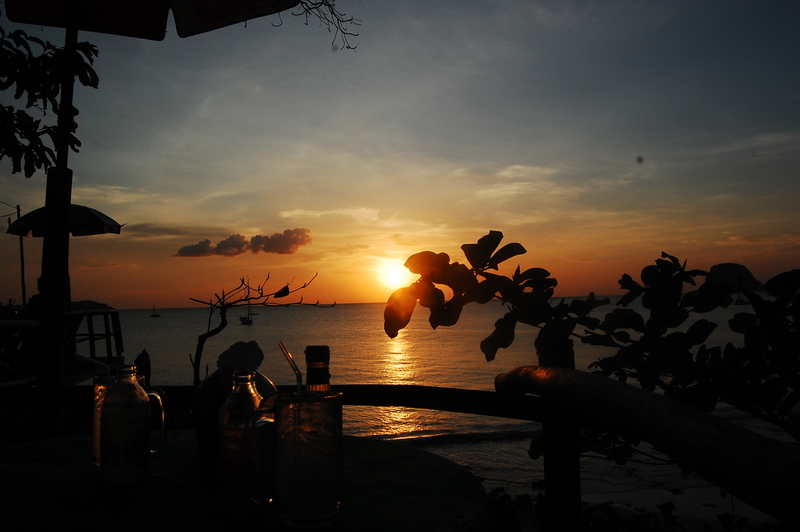 Dinner at sunset on Koh Mok. Following this adventure we kayaked along the island’s coast, exploring some of the amazing limestone rock formations and coves along the way. Although we tried our best re-applying sunscreen constantly the salt water got the best of us and we both have rather ridiculous patches of burn in splotches on our legs and arms. Tomorrow we’re leaving for Khao Sok National Park where we’ll spend a night and two days before taking a night train from Surat Thani to Bangkok. I’ll try to add some photos soon. It’s been a while since I have had proper access to the internet so I apologize for the lack of regular updates. Even the computer I am using now is mediocre so unfrotunately I won’t be able to post any photographs but as soon as I get a chance I will. In the meantime there is a lot to catch up on! After climbing Kinabalu Therese and I caught a flight to Bali where we would spend a week exploring the Indonesian Island. 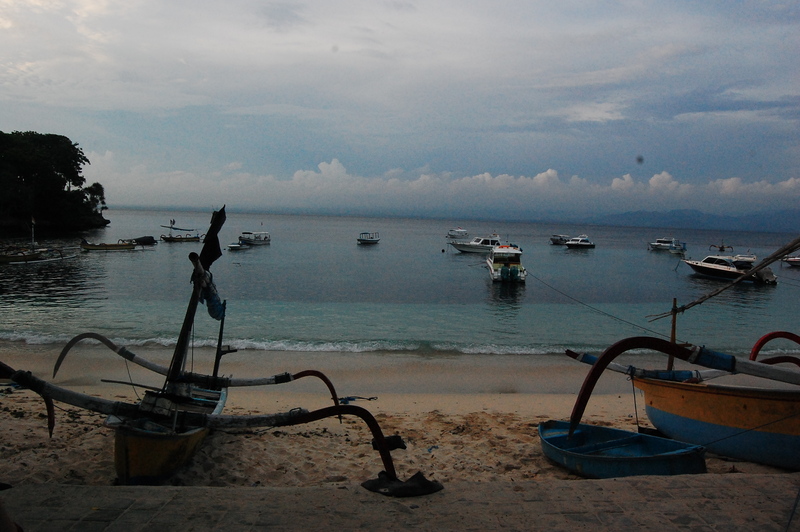 We started with a night in Sanur before catching a local ferry to Nusa Lemogan – one of the islands off of Bali. The boat ride was wonderful, salt water splashing onto our skin and some of the local children befriending us. We spent the hour trip trying to communicate, playing games on the bow of the boat. Balinese dancers performing at the Palace Theatre in Ubud. Lemogan is a beautiful island, but it still was not my favourite. I think in general Bali won’t be a highlight of the trip. Although there were amazing moments, like watching a traditional Balinese dance accompanied by a Gamelon orchestra on the palace stage in Ubud, in general the island feels too touristy. As soon as you arrive you are aware of how important you are to the island’s economy and the demands on your wallet don’t subside. You’re constantly being hassled by taxi drivers, shop keepers, street vendors and hotel owners. While on Lemogan we celebrated my 24th birthday with a snorkeling trip. This was a highlight of Bali as well. We arrived at the beach of the little bay we were staying at at noon and boarded an outrigger-style boat. It was just Therese and I and the boat’s captain who didn’t speak a word of English. When we would arrive at one of the coral reefs (there were three stops to our tour) he would slow the boat and point and we’d jump in. The fish were beautiful – all neon coloured and swimming in schools amidst the coral. At time I’d find myself chasing one that had caught my eye and I’d realized I’d wandered quite far from the boat. By the second stop it had started to rain, making the third stop impossible but it added to adventure. We road the rickety boat home in the pouring ran huddled on the deck in our life jackets to keep warm laughing the entire way. Ubud was a lovely change of pace, which was our next destination after Lemogan. We arrived in the morning and quickly found a great bungalow homestay with Mama Whinney, near a football field in the centre of town. Mama Whinney was quite a character taking us under her wing and sharing tips on the city. Jungle book is real! The Monkey Sanctuary Temple in Ubud. Ubud is one of the inland cities in Bali and boasts a colourful display of Balinese culture with delicious (and incredibly reasonably priced) food, dance and fire shows, temples, the Ubud palace and wildlife a short walk away. 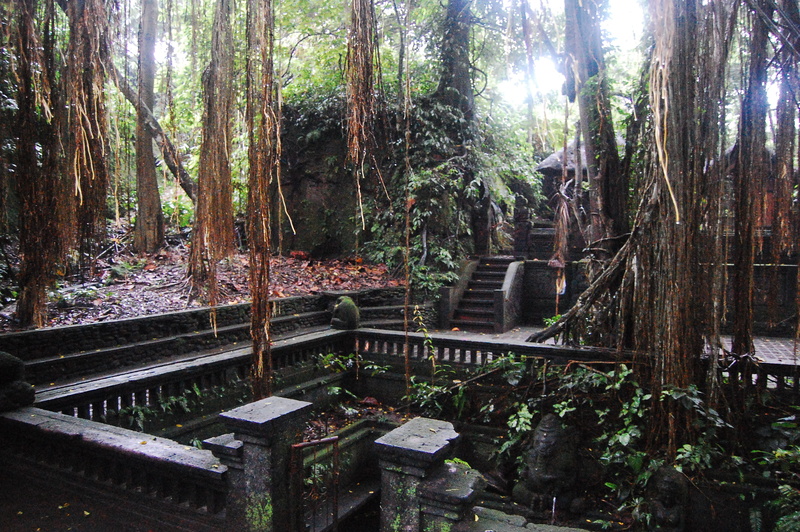 It also is home to the Monkey Sanctuary Temple which looks like it is straight out of Jungle Book. Monkeys are everywhere and the jungle has grown around the ancient buildings. Following our stay in Ubud we took a taxi to Kuta for our last night before flying to Phuket in Thailand. Kuta was horrible but spending a night is inevitable as it is so close to the airport. The city is on the water, which looks stunning until you start wading in and realize the coast is full of garbage. Still the beach is quite populated, mostly by people learning to surf in the dumpy water. The rest of the city is this weird juxtaposition of total destruction (construction and development is happening everywhere) and western commercialism (Kentucky Fried Chicken, Billabong etc.) The place is overrun with young people cruising the streets in patching Bitang (the local beer) tank tops getting ready to hit the many night clubs. Needless to say Therese and I were both unimpressed and relieved to get on the plane the next morning and head to Thailand.